Transfer your PIM data to your iPod. Is there a better alternative to iPDA? Is iPDA really the best app in Applications category? Will iPDA work good on macOS 10.13.4? 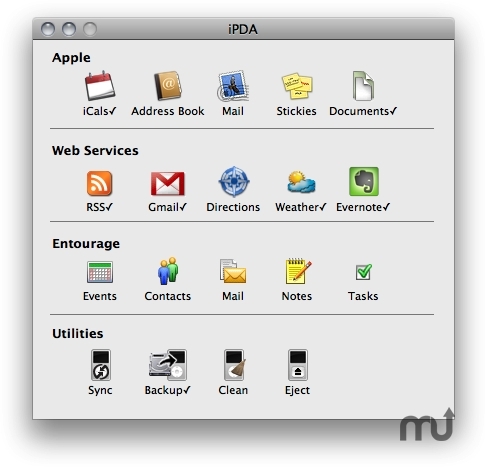 iPDA (formerly iPod It) can transfer your PIM data to your iPod so it's available whenever you need it; iPDA supports transferring information from Entourage, Gmail, Evernote, Stickies, Mail, Address Book and iCal (including Google calendars). You can transfer Word, PDF, Pages, RTF and text documents for quick access and reading on the go. You can even download weather forecasts and RSS feeds directly to your iPod. Updates Evernote support to work with the latest version of Evernote. Mac OS X 10.5 or later, Apple iPod. iPDA needs a rating. Be the first to rate this app and get the discussion started!